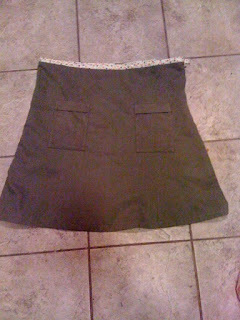 I just made a really cute skirt from a pair of men's pants. 50% cotton, 50% rayon, olive-y brown, basically a soft dark khaki. Homemade 30's style cotton bias waistband, patch pockets made from the cuffs of the pants.